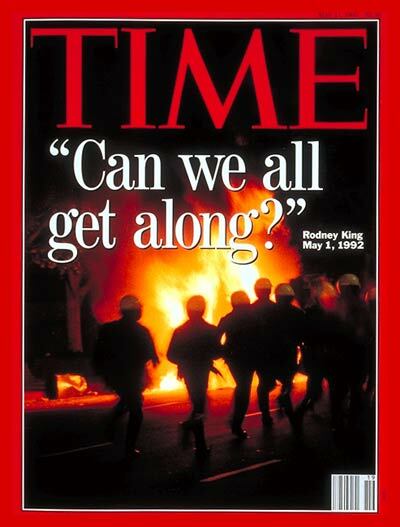 On April 29, 1992, Los Angeles exploded with violence, and the police department all but abandoned the riotous city. I was in inner-city LA just two weeks before the riots. I was leading a group of teens from my church on an urban immersion. This wasn’t a “mission trip.” We were there to learn about the city and to talk with ministry leaders. The result of that trip was the same as every other Los Angeles immersion I’ve led in the past twenty years: my students are amazed to find that God is already in the city, that they don’t have to bring him there and that he is actively moving in the lives of city dwellers. But the trip we took over the Easter break in 1992 was different. I remember thinking that the air was volatile, filled with hostility. While walking through the Pico Union district, near MacArthur Park, our group (including me and six white teens) was stopped by the LAPD in the heart of the infamous Rampart Division. “Do you know where you are? What are you doing here?” we were asked through the open window of a police cruiser. I told the officer we were doing church work and we knew exactly where we were. Stopping short of telling us that white people didn’t belong in that neighborhood, he warned us to be careful and sped away. A short time after we left LA, the verdict of the Rodney King trial was announced. King, an African American man, was the victim of a brutal police beating that was filmed by a bystander and then played on news shows around the world. I remember watching that horrible beating on television again and again. The four officers, three white and one Hispanic, were acquitted. Shortly after the verdict was read, members of the African American community began marching through the streets of Los Angeles, many armed, all angry, thus beginning five days of rioting. But there was another man that many of us have forgotten about. Reginald Denny, a white truck driver, was also a victim of the riots. I remember seeing it live on TV. Denny was stopped by the rioters at the intersection of Florence and Normandie, and was pulled out of his truck. He was beaten badly by the African American crowd and left convulsing on the street. Denny was rescued by Bobby Green, an African American man who saw the attack unfolding as a news helicopter broadcast it live. Denny never fully recovered from the beating. My close friend, Tim Peters, was living in a dilapidated SRO hotel in the heart of the rioting. He was the only white man in a building full of African Americans and Hispanics that were technically considered homeless. But Tim had lived there quite a while and was known as “Pastor Tim,” the guy who led kids clubs, helped the poor and brought church groups to live in the hotel. “Stay in your room, Tim,” came the instruction from the other hotel residents. “We got your back.” Tim remembers seeing fires burning and military helicopters flying down the streets between the high-rise office buildings. Pretty crazy for a farm boy from Hillsboro, Kansas! Tim told me that many people offered him loot from their sorties into the surrounding shops. Hotel residents were coming home with televisions, VCRs, and other bounty. Tim politely declined, offering instead an alternate narrative of peace and justice. Another thing that most people never realized about the riots: Tim personally witnessed many in the community feeling remorse for their actions and actually returning items they had stolen. I guess that doesn’t make for exciting news footage. One more oddity of the riots I remember. While this has often been interpreted as a racial war between blacks and whites, it was actually the Korean American businesses that were most badly looted and damaged. In response, armed militias of Korean Americans formed to protect their storefronts. On my next trip down to LA, I witnessed block after block of Korean businesses that had burned to the ground. What happened in Los Angeles in 1992 was so much bigger than the Rodney King verdict. Every time I drive through the intersection of Florence and Normandie with a van full of college students, I tell them about King and Denny (they don’t know the story of the riots anymore), and I lament the complexity of a system that continues to perpetuate racial divides of all kinds. Systemic injustices will never be solved or compensated with a court verdict. We are part of systems that do not have “right” answers. So what am I to do? When faced with racial injustice, I have to continually ask questions like, “How might God’s love be demonstrated here? What is the most Christ-like thing to do? What will the Spirit open my eyes to see in new ways? What can I learn from my non-white brothers and sisters?” Hopefully, prayerfully, my small moves will work together with others to change and influence the principalities and powers that reign with such a tight grip over all of us. Of course, I write this as a privileged white male. It’s always easy to be theologically glib when in control of the systems.